Preheat oven to 375°F. Place the whole graham crackers in a re-sealable plastic bag and crush with rolling pin, then measure 1 cup of crumbs and discard the rest. In a medium-sized bowl or a food processor, combine the graham cracker crumbs, raw sugar, 3 tbsp shredded coconut, whipped butter and 1/2 tablespoon of water; blend until it has a texture of coarse meal. 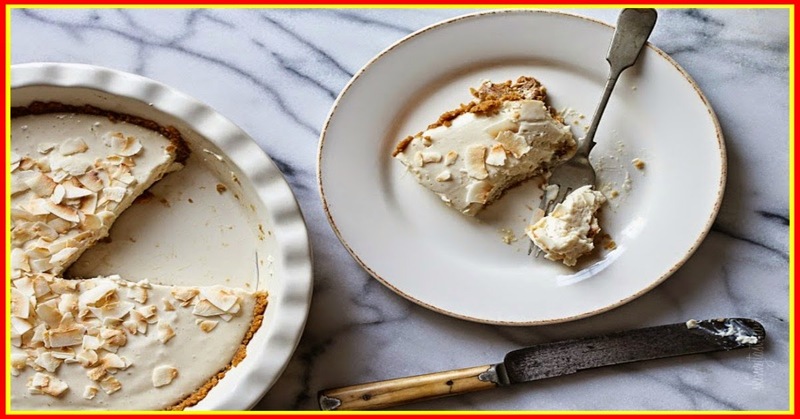 Press into an 8-inch pie dish making the crust about 1/8-inch thick evenly all around and up the sides, evening the crumbs up to make sure there are no gaps or holes. Note: If you refrigerate the crust for 30 minutes before you bake it, this will help prevent crumbling when you want to serve it. Bake until the edges are golden, about 8 to 10 minutes. Remove from the oven and let the crust cool on a wire rack, before filling. Meanwhile, dissolve the gelatin in 1/2 tablespoon of water in a small bowl for 5 minutes. Lightly mash the silken tofu with a fork and place it in the blender with the coconut cream and remaining tablespoon of shredded coconut and blend until smooth, about 1 to 1 1/2 minutes. Heat the 1/4 cup of coconut milk beverage in the microwave 40 to 45 seconds, and mix in with the gelatin until dissolved, 2 to 3 minutes. Transfer to the blender and blend until smooth. Pour into the graham cracker crust and refrigerate until it sets, about 3 to 4 hours. Top with shaved coconut, if desired.